They say a picture is worth a thousand words. Sometimes a picture comes with nearly a thousand words, for instance if you were referred for an MRI or CT scan for your back. Imaging findings would probably come back with a long list of unfamiliar jargon words that might cause some concern. Disc bulge, annular fissure, facet degeneration etc..
What should you do with that information and what does that say about your spine? To get the right perspective about your back imaging you could take a short look around, can you spot anyone with graying hair? (if not just imagine.. no harm in that) If a person with grey hair would complain of headaches will you blame his hair for it? Obviously not. He does have white hair on his head and his head dose hurt, but they do not necessarily relate! How do you know? Because yesterday he probably still had white hair but no headache, and lots of other people walk around with white hair but without a headache. Indeed they might appear together, but not causing each other. So what dose graying hair has to do with back pain? As we age, our body changes from the inside as well as it changes from the outside. Some of these changes will happen in the spine as well. In an interesting study (http://www.ajnr.org/content/36/4/811/tab-figures-data) , the backs of over 3000 participants (with absolutely no back pain!) was scanned to see what should a normal non painful back look like – and as the results show – all those scary words are, in many cases, just normal changes of our backs over the years. 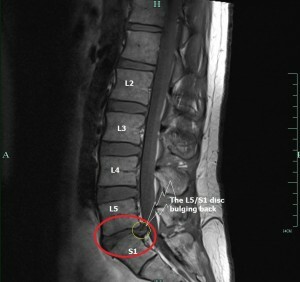 So if I did a scan and it showed a bulging disc or degenerative changes, is something wrong with my back? Not necessarily. As you can see from the graph above for example half of all people in their 40’s have disc bulges yet have no pain or any back problem at all! A good chance is that those imaging results were the same before you had any pain, and could stay just the same after your pain will be long gone. Just like wrinkles or graying hair, it comes with age but doesn’t mean something is wrong. So why dose my back hurt than? There could be many different causes for back pain, most of them improve well with the correct diagnosis, proper treatment and exercise. If your back hurts, don’t hesitate and come on to know more about it and how to treat it effectively!